Dentures, just like natural teeth, require daily maintenance to stay clean and keep bacteria from growing inside of your mouth. Keep your dentures clean and your smile healthy. When handling your dentures, stand over a clean, folded towel or a sink full of water. This way, if you accidentally drop your dentures, they are less likely to break. Your dentures are not immune from plaque and tartar build-up, so it's important that you brush your dentures every day. To brush your dentures, use a soft-bristled brush and gently brush the surfaces of the dentures, being careful not to break or bend the plastic. Between brushings, it's important to rinse your dentures after each meal. When you are not wearing your dentures, they need to be kept moist. Dentures that are not kept in a denture cleaning solution or in water can dry out, lose their shape, or even crack and break. Certain styles of dentures require certain soaking solutions, so be sure to ask your dentist which solution is best for you. Even if you have a full set of dentures, it's important to keep your gums and tongue clean. Be sure to use a soft-bristled brush to gently clean your gums and tongue every day. 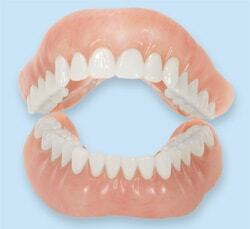 If by chance your dentures do break, please contact us and schedule an appointment as soon as possible. Broken dentures that don't fit properly can cause irritation to your gums and mouth.